Note: The first part of this article is an introductory piece. See “The Aftermath” section to read our thoughts on the event! “What do people do at a food festival?” At first glance, such a query would seem to stem from an exam paper at the “School-Of-The-Blindingly-Obvious”, but it is in fact, a perfectly valid question. Of course, for the most part, a food festival is an opportunity to see how close you can come to resembling a Michelin-Man in a single day, but it’s also an opportunity to celebrate culture, embrace tradition, and explore innovation through the medium of taste and smell. This, in a sentence, is the mission of the London Halal Food Festival (HFFL) of 2016. Taking place on Saturday 20th and Sunday 21st August at London’s iconic Tobacco Dock, the HFFL is geared up to be a monumental event, and promises to showcase the very best of London’s halal industry. Of course, such a statement is airy at best, so the question remains – what does the festival really offer in tangible terms? Well, let us begin with the hundred-odd stalls that will be serving up a whole host of products and tantalising food items from the biggest and newest halal eateries in London. Take the opportunity to get your hands dirty with Brioche Burger, bust your gut with Meat & Shake, or dissolve your sweet tooth with handcrafted chocolate dates from The Datery, and return home “healthier” and happier than you were when you walked in. There will also be a dedicated dessert parlour armed with cakes, shakes, and everything in between, as well as a carefree bar serving up a range of classic mocktails, and an exclusive shisha lounge for those who wish to kick back, relax, and moonlight as a human chimney. Go on, enjoy a box of these. I’ll keep my forceps ready. If, like myself, you often end up summoning the fire brigade whenever you set foot inside the kitchen, there will also be a chance to learn from some of your favourite celebrity chefs at one of the many live cooking demonstrations taking place throughout the day. Master Mauritian cuisine with Shelina Permalloo (MasterChef), say goodbye to scorched scones and charcoal cakes with Ali Imdad (Great British Bakeoff), and leave the festival with the confidence to invite your friends over for dinner without test-feeding your goldfish first. (I was kidding – please don’t dump a lasagne into your goldfish bowl). 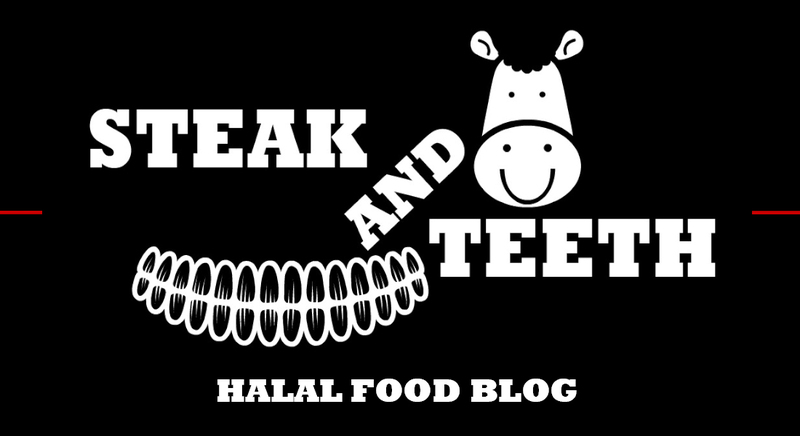 And, if that wasn’t enough, you’ll also have the chance to meet the “Halal Heroes” – a greedy group of the HFFL’s headlining halal food bloggers, which of course, includes your favourites here at Steak And Teeth! An exciting prospect right? RIGHT? With so much going on under a single roof, the London Halal Food Festival is set to be one of the biggest halal food events in London so far, and I for one cannot wait to sink my teeth into it. Put on some sunglasses to avoid the solar flare emitted by my gigantic forehead, wear soft shoes to avoid crushing my dwarf-sized companion, and join us as we indulge in the most exquisite halal food that London has to offer. Tickets can be purchased here, and updates can be received via the HFFL’s Facebook, Twitter and Instagram pages. 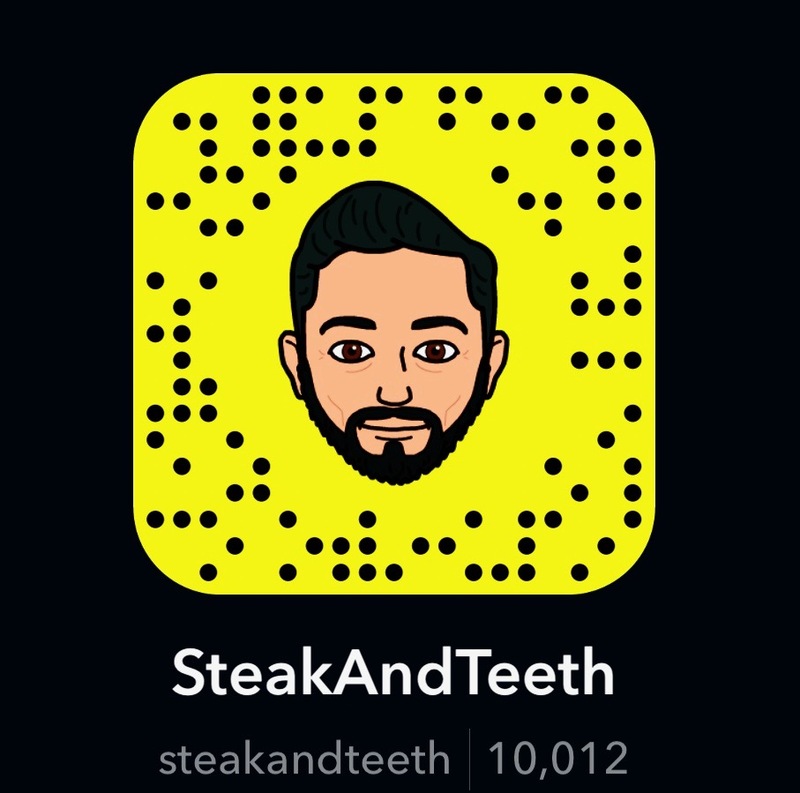 Steak and I really look forward to seeing you all there, and we hope that you’ll share your thoughts with us, eat to your heart’s content, and above all, have an absolutely fantastic time! See you in a week’s time, and don’t forget to bring a spare belt! And so, the London Halal Food Festival of 2016 has come and gone, and the fallout has left many of us with significantly shorter, but happier lifespans. I myself visited the festival on Saturday with Steak, and on Sunday with “The Mistake”, and thus, I was able to appropriately pace myself and sample many of the edible exhibits on offer. After taking a recon-stroll around the dock, Steak and I knew exactly who our first victim would be. Having relaunched last year as a Southern BBQ smokehouse, Meat and Shake came to the festival with a mobile meat smoker, and all hands were on deck to serve up a selection of beef brisket and pulled chicken burgers. Of course, we opted for the beef brisket, and found it to be as soft and succulent as it looked. It’s clear that Meat and Shake have improved by leaps and bounds since we last visited them, and we will certainly be paying a visit to their Ealing or Watford branch to bite into more of their smoked meat. The newly-established HS&Co were also on hand to provide a meaty death, serving up three variations of chicken wings and a cholesterol-laden philly cheesesteak sandwich. The honey and chilli chicken wings were certainly a great nibble, with a crispy and sticky texture that went hand in hand with the subtle, sweet flavour. The philly cheesesteak meanwhile, was gooey and tender, and the thick loaf certainly held its own, but for £6, it could have done with a more generous helping of meat. The baptism of fire for “fresh meat” continued with the likes of Amoricana, an American-style pop-up that has been around for no more than a few months. They certainly generated a lot of excitement on the Saturday, and so, when it came to Sunday, we decided to try their signature “Amoricana burger” – a 9oz contender that came topped with a generous dose of beef brisket. Whilst the brisket was soft and succulent, the patty itself was drier than Donald Trump’s wig on a hot summer’s day, and sadly, no amount of cheese could compensate for it. Having overheard similar comments from other tables, and from other patrons throughout the day, it’s clear that it was a widespread problem. A little more care is certainly needed to avoid overcooking the patties to such an extent, but we’re still hopeful that Amoricana will iron such problems out as they grow in experience. Of course, we’d expect to see some veteran pop-ups at any halal event, and Bun Kabab were on hand to fill that role with their usual selection of beef and pulled chicken buns. Having already beefed ourselves out, we opted for a pulled-chicken bun, which was simple and satisfying. Ultimately however, we were expecting stronger flavours and a far more generous helping of tamarind and raita. We also discovered some establishments that we had not yet heard of, including “Gaucho Asado”, a halal Argentinian steakhouse based in Queensway. Their stacks of smoking ribeye were certainly alluring, but we decided to hold off from their sliced steak wraps and plan a proper visit to their restaurant later. Of course, any Dentist would recommend that you look after all of your teeth equally, and so, I sought out as many treats for my sweet tooth as I could. From rich chocolate truffle tarts to soft and fluffy matcha brownies, Ali Imdad put on quite the spread at his stall, and certainly took the festival by storm. Truth be told, I made the terrible mistake of buying just one matcha brownie, and was filled with nothing but remorse and regret when they sold out. Of course, the aesthetic appeal of any dessert is just as important as the taste, and The Apple Blue Patisserie have clearly nailed both. Armed with beautifully crafted tarts that were simply too attractive to eat (though we all did anyway), they were by far the most popular dessert vendor at the festival. Dum Dum Donuts and The Datery also made an appearance, bringing stacks of decadent delights that were cleaned off by the end of each day. The live cookery theatre also proved to be highly popular, with a full audience throughout the day as celebrity chefs showcased a few of their favourite recipes and handed out some handy hints. It was also the venue for the four “Halal Eat-Off” competitions that took place that day, two of which, we attended. 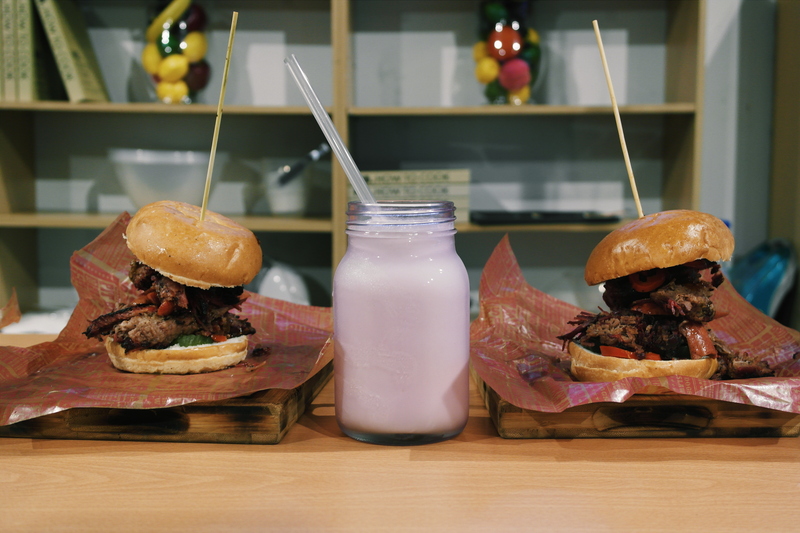 The Meat And Shake Eat-Off was by far the most entertaining, and the well-laid-out stage soon turned to carnage as the four contestants battled with both their burgers, and with each other. As you can tell from the photo below, the losing contestants weren’t too happy about being shown up. The festival was also a chance for both small and new Muslim businesses to showcase their products and services, and we were delighted to meet so many passionate entrepreneurs in one go. It was particularly delightful to “meat” the team behind Halalnivore, a newly-launched halal gourmet meat club. Their goal is simple – to deliver freshly-cut burgers, steaks and chops straight to your door. Finding halal meat is easy, but finding quality halal meat is the challenge, and we’re certainly looking forward to receiving our first box! Also at the festival were “Nojito” (not pictured), a mocktail company whose non-alcoholic drinks were simply delightful, and Desert Farms, a UK-based company retailing fresh camel milk and camel milk powder straight from the fields of Holland. All in all, we thought the London Halal Food Festival was a great success, and it was absolutely delightful to meet some of our fellow halal food bloggers, and some of our followers. More importantly however, we’re keen to see how the festival will evolve over the coming years. The halal industry is growing at an exponential rate, and with so many halal eateries in London, we would certainly like to see a much bigger event next year with an even greater number and variety of halal exhibitors. Until then however, we must wait patiently for the next incarnation of what can only be described as a truly fantastic event.